tracieclaiborne.com: Did ya have a good Turkey Day? Did ya have a good Turkey Day? I worked today so I'm just now getting time to update. Hope you had a happy Thanksgiving! We went to the in-laws. Good food. My MIL makes the best turkey gravy. I ate as much as I could possibly hold. We didn't stay long, I had much to do at home. I'm almost finished decorating the Den. I hope to finish up tomorrow with the living room tree and garlands. 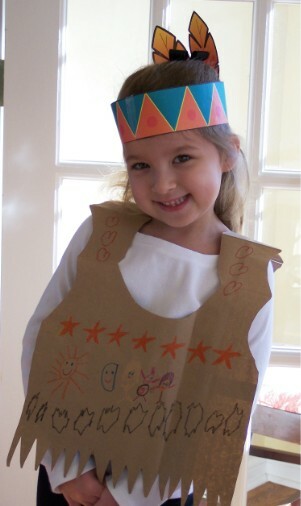 Here's my little Indian girl with her Thanksgiving Day art project on. She's been very sick with a fever but tonight she was finally feeling a bit better. Thank you Jesus!! I was worried about her. She's been sick since last Monday. Happy weekend! What did YOU do for Thanksgiving? We never got around to making feather headbands this year....everyone's been sick.